It’s go time for Dreamforce 2014. With Salesforce’s annual conference a mere week away, we’re busy gearing up for what’s sure to be an amazing week of Yeti sightings, party bus commuting, and spreading the news about an all new Yesware. 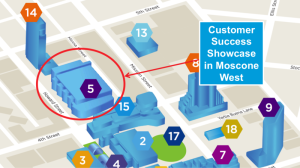 Where: Dreamforce, Moscone, San Francisco — who knows?! As you know, most Yetis have a serious case of wanderlust (no wonder scientists can’t find them). The Yesware Yeti is no exception. In fact, he set off by himself just last week to go visit Yesware’s new San Francisco office. But now we’re starting to get worried: Our favorite globe-trotting mascot has gone off the grid and we can’t find him anywhere! Sources say Yeti was last seen hitchhiking to Moscone. Your mission is to track him down. 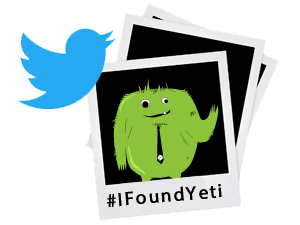 If you find the Yeti around Dreamforce, tweet out a photo and be sure to mention #IFoundYeti #df14 @yesware. That tweet will enter you in a contest to win a $1000 cash reward. The winner will be selected at random and announced on October 16, via @yesware. Learn more about the great #IFoundYeti hunt. Technology has leveled the playing field for small and medium businesses. Whether the idea is about improving people’s lives, making things accessible, or green technology, there’s nothing like a good startup tale of creative disruption to deliver us from something old and tired. 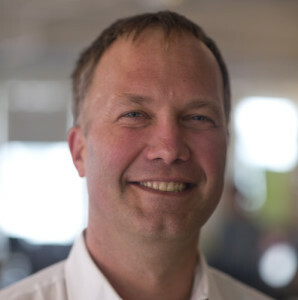 Matthew Bellows, Yesware CEO and cofounder, joins this panel to discuss the road to Yesware and what’s ahead. Meet face-to-face with the friendly folks of Team Yesware and see live demos of our soon-to-be-announced brand new offerings for the Enterprise. We can’t wait to show you what’s in store to help you sell smarter and connect with prospects more effectively. And of course, there will be lots and lots of Yesware swag to go around. Where: See routes below for bus stop locations. Dreamforce after-hours parties are as legendary as they are fun. But you know what’s not fun? Trying to navigate from one party to the next in an unfamiliar city, when you’ve been walking around Moscone in uncomfortable shoes all day (been there). Or missing out on said fun because you’re stuck in gridlocked traffic (done that). Good news, party hoppers: This year you can hop on the Yesware Party Express Bus and keep the fun going while we get you to your next party destination. Rides are FREE for all Dreamforce attendees (be sure to wear your badge) and we’ll have free booze, food, and music on the bus to help you kick back and relax after a long day of sessions. Just look for the big green bus. SMB Blast Off — Jones Bar, 620 Jones St. Cloud Octane Party — 111 Minna Gallery, 111 Minna St.
Appirio Party — 736 Mission St.
ThirstyBear After Party — 661 Howard St.
Get to Yes Party — The Box SF, 1069 Howard St.
Where: The Box SF, 1069 Howard St. Whether you join us for an early cocktail, or a late night snack, you’ll want to mark this as a definite stop during Wednesday night at Dreamforce. Want to stay in the loop, but don’t have time to sit through two+ hours of keynotes everyday? We got you covered. Be sure to follow Yesware on Twitter (@yesware) for live updates throughout Dreamforce, as well as daily roundups here on the Yesware blog each evening.